I know what you're thinking. 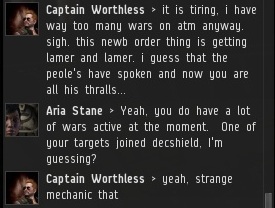 You're wondering what ever happened to Captain Worthless, who paid 50 million isk to declare war against my one-man corp and got trapped by Dec Shield for his trouble. Captain eventually skulked back to Abudban and began complaining about his plight in local. He was outraged by Aria Stane's economically rational policy. 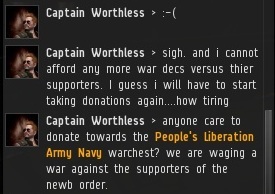 Captain threatened war, but was defeated by the faulty war mechanics--mechanics intended to benefit carebears, but bent to the will of the New Order. 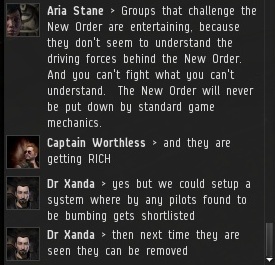 At the very least, the New Order provided an education in wardec mechanics. Fellow sad sack Bruno Mussolenth joined captain in his misery. Aria offered a tantalizing tidbit about our upcoming ganks, but Captain was in no mood to explore that subject. Captain's anger became focused on all the people who purchase mining permits from the New Order. 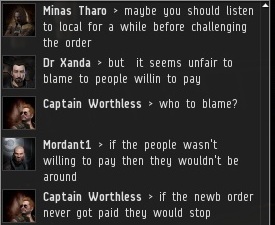 Akin to the "principle" argument, some miners refuse to pay because they fear it will encourage the continued existence of the New Order. The problem with that reasoning is, the miners who feel that way can't actually stop other miners from paying. If everyone stopped paying taxes, the government would be powerless, but the average person can't avoid taxes simply by hoping everyone stops paying. Dr Xanda encouraged solidarity against the bumpers, rather than dividing the mining community against itself. As Captain's anger grew, he practically became a recruiter for the New Order. 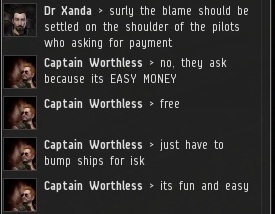 The riches to be gained through bumping infuriated Captain. Xanda's solution of "shortlisting" the bumpers didn't go anywhere, as you might have guessed. One stumbling block with Xanda's plan is that no one knew what "shortlisting" meant. Glory to the New Order, which has such power, even over the faulty game mechanics designed to protect our enemies! 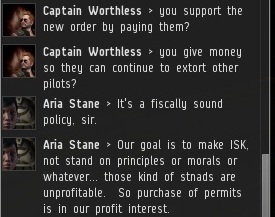 I just did the Maths on the 10M isk mining fee. Assuming a miner makes 100M a day mining, the fee would amount to a 0.027% taxation rate for the year. A truly miniscule amount for a year's peace and security. But their "principles" Ganky, don't forget them. 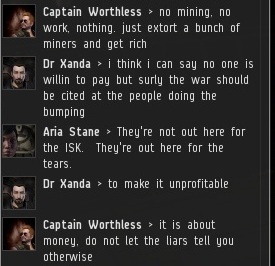 Miners are a prideful lot (Although I'm not). Which makes zero sense but there it is. That is if you only have to pay once. In my system a new bumper appears about every 2 weeks demanding a mining fee. One solo bumper? How is that relevant? Do you not obey the law, backed by millions of police officers, because every so often one person goes against the law? I think 10,000,000 is less than 280,000,000 even in miner math. How much does principle cost? Apparently 270,000,000 is the current price of principle. Shall I Compare Thee to a Nazi? How Do I Join the Knights of the Order?